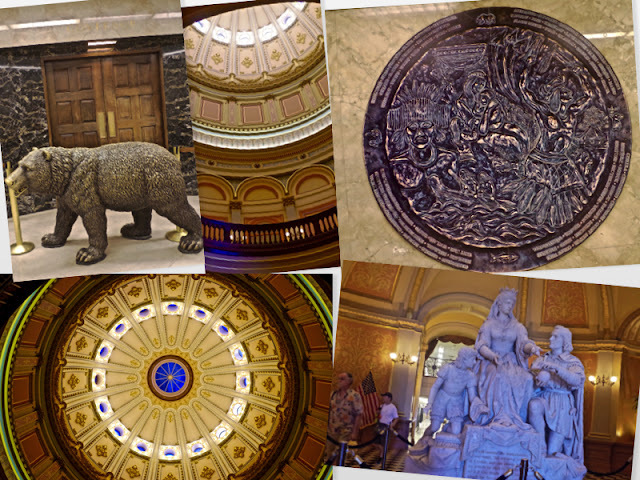 In order for us to get to the coast to see the Redwoods…we decided to make a quick stop in Sacramento to pay a visit to California’s State Capitol. For all the years we lived here, we never visited this particular capitol! 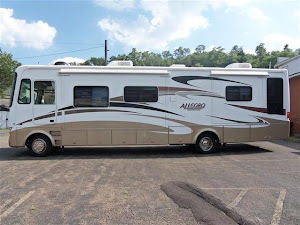 Since we’ve been trying to see each state’s, I thought it was “about time” we added California’s to the list, so we booked ourselves into a campground for the weekend. 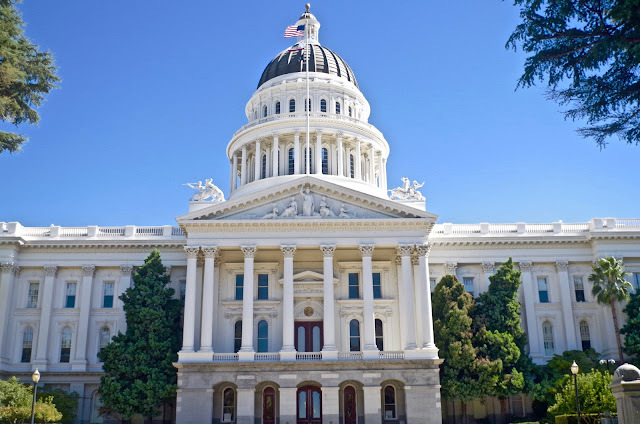 We headed for Old Sacramento, as all that was in front of the Capitol building, so we decided to save viewing it until tomorrow. With the majority of the crowds downtown, it was a wee bit less busy here (still just as hot tho). The buildings and the wooden sidewalks may be “olden” but the T shirts, gadgets and souvenirs are sure the same ole “stuff” (ugh). There must have been a “candy” store every 4th building (how much sweets can people want?). 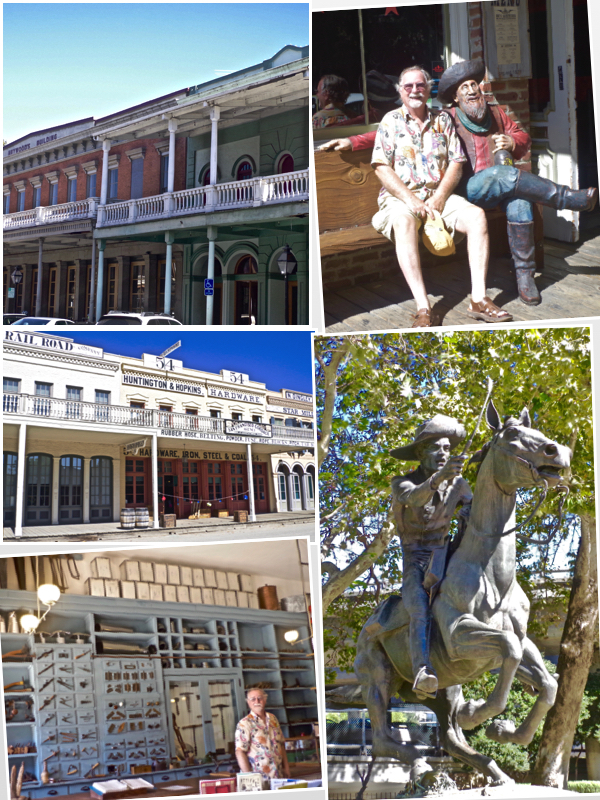 We enjoyed the 1853 Huntington & Hopkins Hardware though, that was interesting, and had a good burger at the saloon in town. The next day we went back into downtown to visit the State Capitol…much quieter. They have the main floor set up like it was back in 1903-1933, which is pretty cool to see. 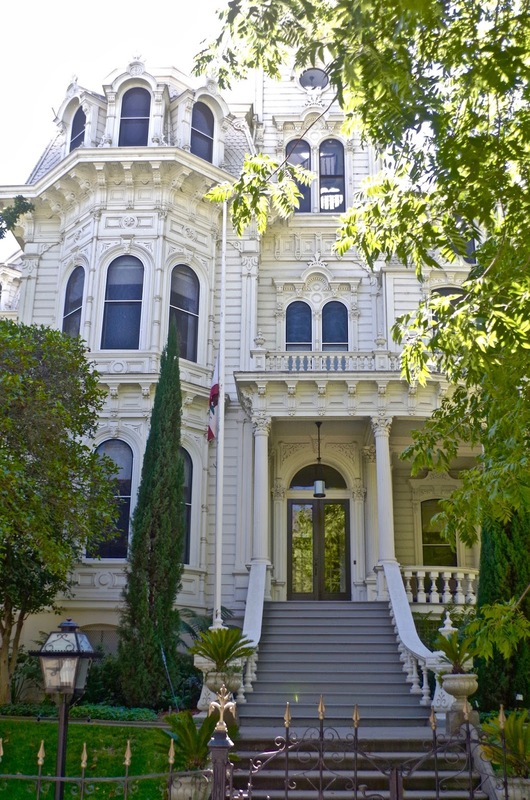 It was first built between 1860-70. Electricity first augmented, then replaced gaslight between 1892 & 1895. In 1906 a remodeling of the area now called the West Wing created more office space. The East Annex, completed in 1952, added even more offices. When a 1972 study of the building showed it to be unsafe in the event of an earthquake (hello, it’s California! 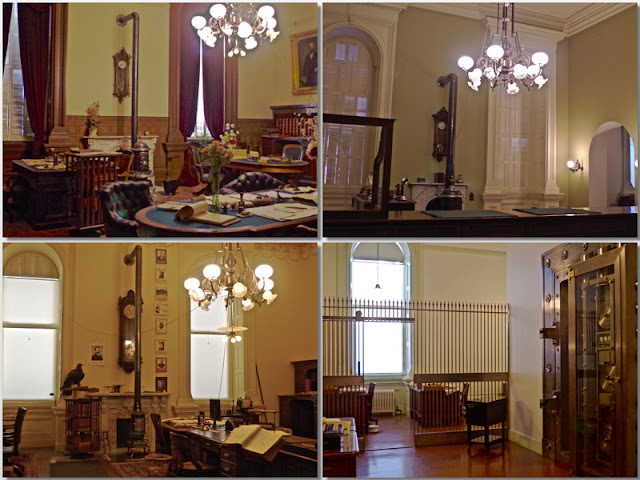 ), the “Old Capitol” was scheduled for renovation By 1982 the building was restored to its original early twentieth-century elegance. Today it is a working museum. They also had a room with extraordinary first edition books, including a page from the Gutenberg Bible as well as one of the finest copies of the 1493 Nuremberg Chronicle, the first great illustrated book, two magnificent Audubon's Birds of America (1827–38), a gorgeous illuminated manuscript from the late Middle Ages and James Marshall's hand-drawn map of the gold discovery site at Sutter's Mill. It was all really cool to see and my favorite part of the whole place! Because of the severe drought, much of the lawns have gone brown, I think in keeping with the “no watering” policies. 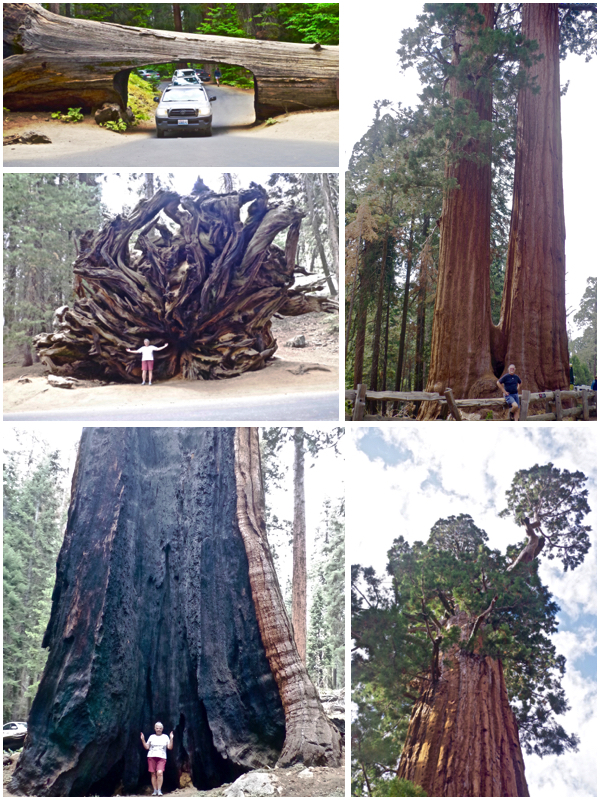 They still have some lovely old trees…including a couple of redwoods! 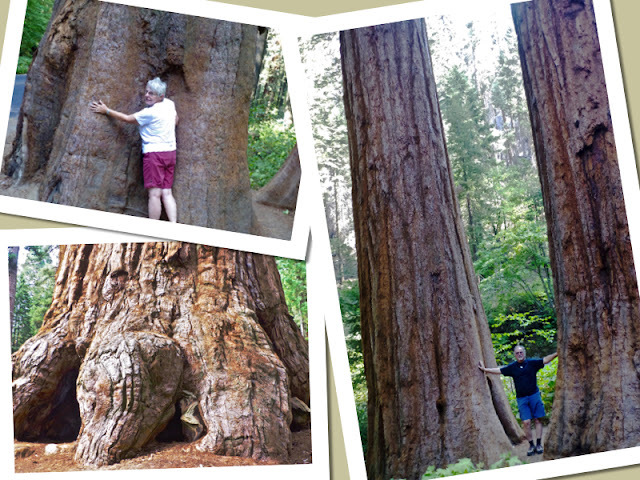 Well, duty done…time to head to the coast and seek out those redwood trees! It had been over 25 years since I’d stepped foot in these magnificent woods…would it be the same? My thoughts and memories tumbled onto each other as we drove closer and closer to my most favorite National Parks, the great Sequoia and Kings Canyon in northern California. I first started coming here as a young kid, somewhere around 7 or so, with my Dad and brother, tent camping. I immediately feel in love with it…those big, beautiful trees and lush meadows! It was the one place I knew I had to take my kids when I had the chance! My boys were just a little older (10 or so) when we went camping there the last time. They fell in love with it just like I did. 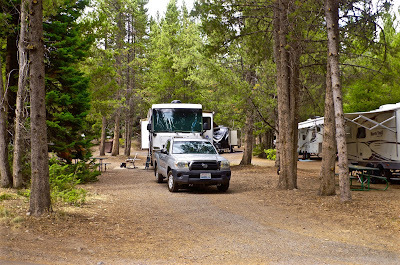 We settled into our campground, and the temperature was already into the mid 90’s and predicted that the week was going to stay that way, phew! 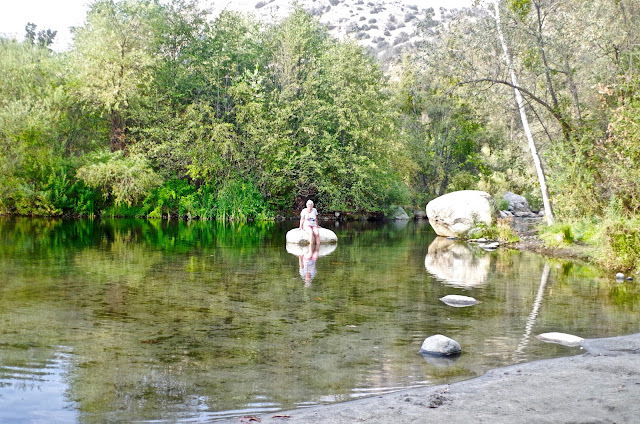 The campground was “basic”, but had a surprise of a private little beach with a wonderful pond formed by the North Fork River passing through it! Beautiful, clear, cool water that was great for swimming or wading (which is just what I did) and sitting and relaxing listening to the birds and the water just gentling running over the rocks. Soon nice… Maybe tomorrow’s visit to the Sequoias will be another wonderful surprise. We got up bright and early and started out. Traffic was not to bad, only about a dozen cars ahead of us at the gate, that soon disappeared as we began the intense switchbacks. (gosh, I remember taking those in my little motorhome 25 years ago and thought my front was going to kiss my behind!) Our first stop was at the “Welcome” sign where we met some folks willing to take our picture (a rarity, we’ve found…and a good sign of the day!). Then came the “Tunnel Rock”…more friendly people…boy, this was going to be a good day! Our “day-trip” through the Parks took us over 8 wonderful hours… We loved every minute of it. The temperature was a good 20 degrees cooler at the higher elevation (highest 8000’) and even cooler in the shade. It would have been great to actually camp inside the Park (although they predicted the temperature to drop to 48 degrees the next day…brr), but no such luck without reservations made well in advance. 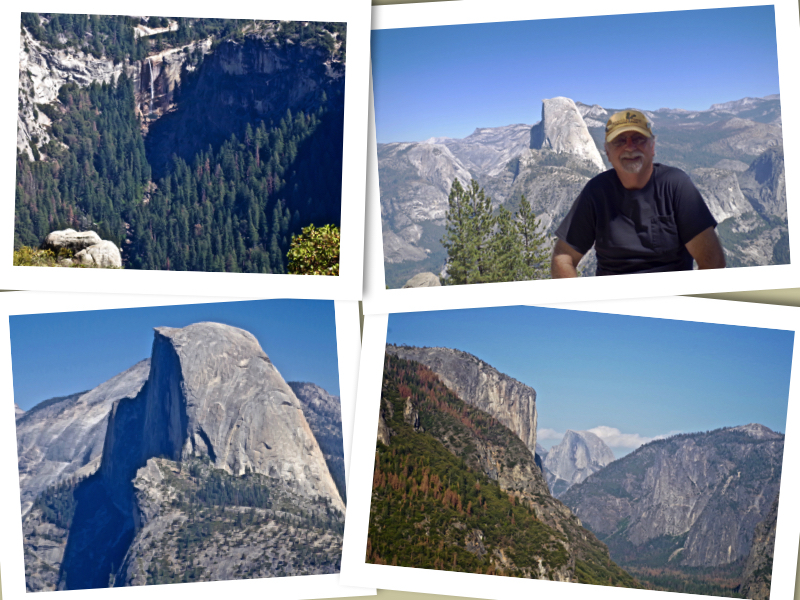 Jack did agree with me…”rocks vs trees…trees wins!” So…off to see some more! 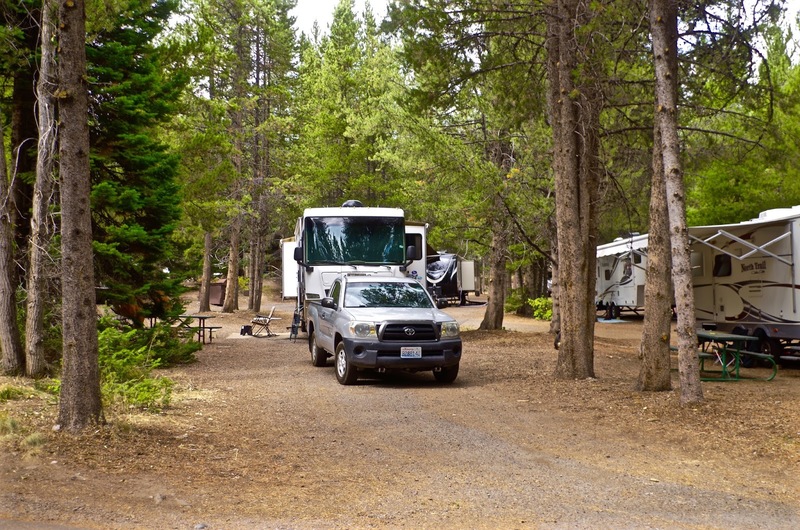 Growing up in California, camping in Sierra Mountains was a natural thing to do. 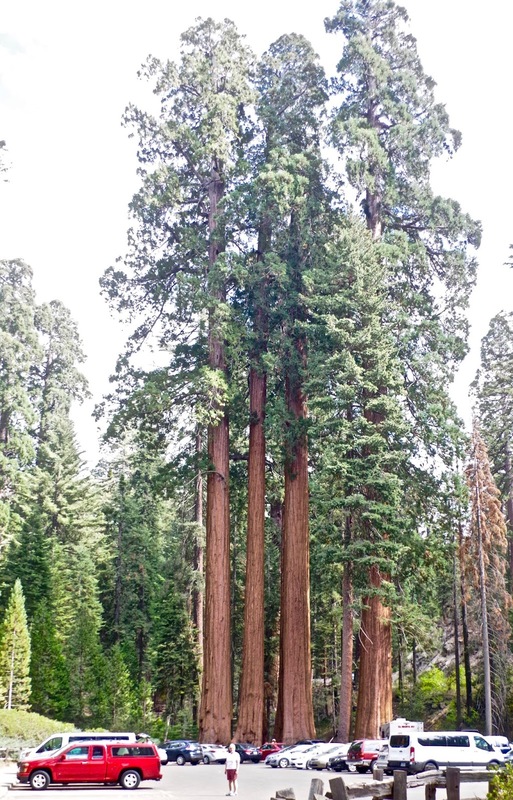 My earliest memories was going to Sequoia & Kings Canyon with my Dad and brother, being amazed by those big beautiful trees. That park was my first true love, and I've never forgotten it. I think I've compared every park to it, ever since, just like one does of their first "human love". My Dad was born in Inyo County at the foot of Mt. Whitney in the small town of Independence, so we visited that area, via Hwy 395 a number of times over the years, but never going any further than Bishop...so, never making it up to Mammoth Lakes. Something I've always wanted to do! 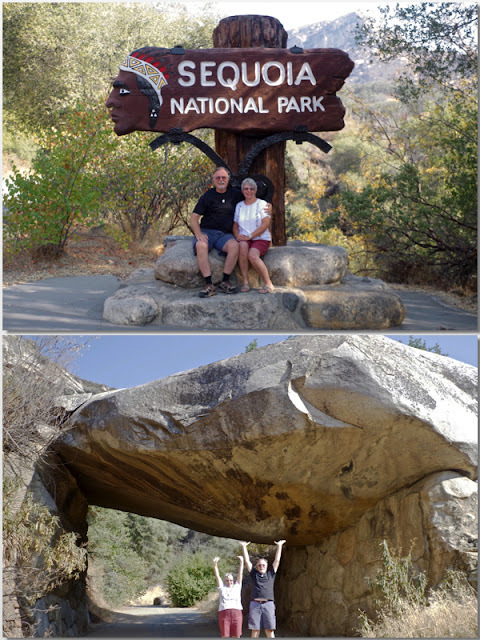 Oakhurst is only about 15 minutes from the entrance to Yosemite, but after you enter, you still have another hour of driving just to get "somewhere"! I hadn't remembered that... It's been about 15 years since I had been to this park and Jack's never been. The last time I was here, I had come with my girlfriends to do some whitewater rafting in early July. The water levels were high and things were still green. All the waterfalls were really flowing and the valleys were filled with flowers. 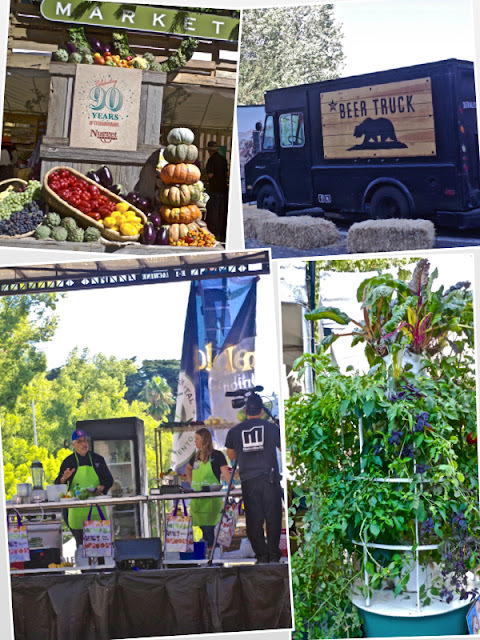 The California drought hadn't taken hold yet. Today...things are very different. 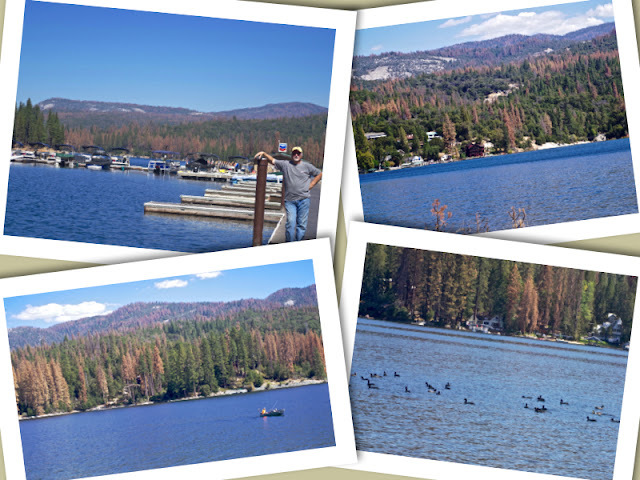 The drought has been in affect for over 5 years and the Bark Beetles have decimated the forests. Along with that, it's the middle of September and what little snow they had has long since melted, so the waterfalls were all but done. The only water flowing was the Nevada falls, way in the distance. The famous Bridalveil Fall wasn't even wet. Sad. Everywhere you looked you saw signs of how dry and damaged it all was. The Village Road was all torn up with construction (a 2 year project) along with the Mariposa Grove where the Gian Sequoias are (closed). The one plus was that unlike the middle of the summer, the crowds were not to bad, so we could get around and find parking at all the turn-outs without to much effort. With the temperatures turning into the 90's, and us not robust hikers anyway, there really wasn't much else for us to see after a full day of driving the loop through the park and all it various stops. 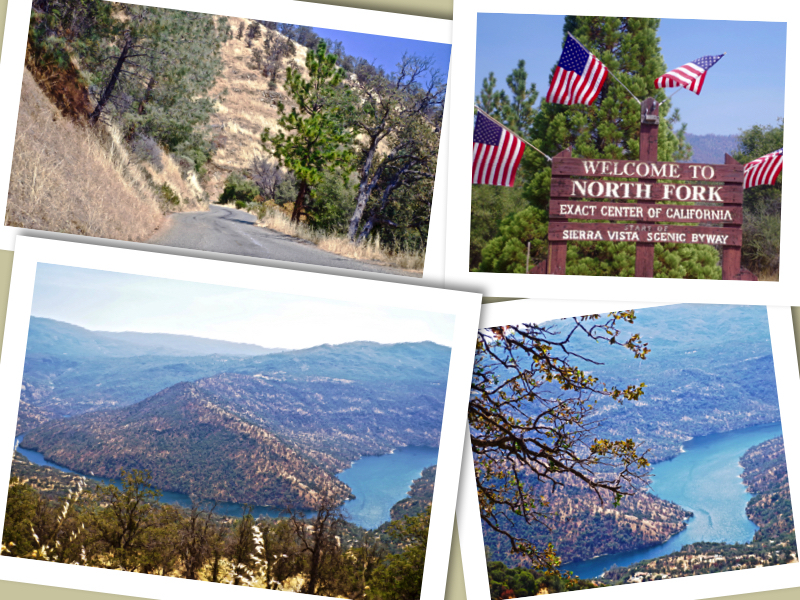 Another day we took the Sierra Vista Scenic Byway through Coarsegold, North Fork (where the exact center of California is) and up along a ridge looking down on Redinger Lake. It was a pretty drive. Not to much beetle damage there, because it was mostly Blue Oak trees and Manzanita. Our 20th Wedding Anniversary was fast approaching, so it was time Jack and I make plans on where to spend it! 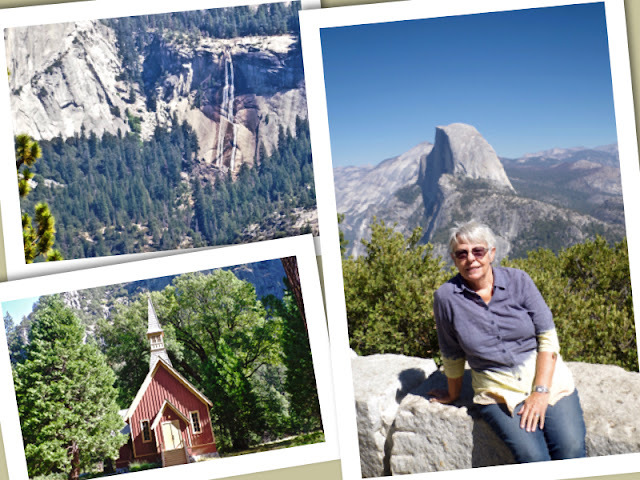 We had talked about it on and off over the months but not knowing what part of the country we were going to be in at the time, we hadn't made any plans. Now that we were in Montana, and September 1st (and being Labor Day weekend) only weeks away, we needed to get serious about it. 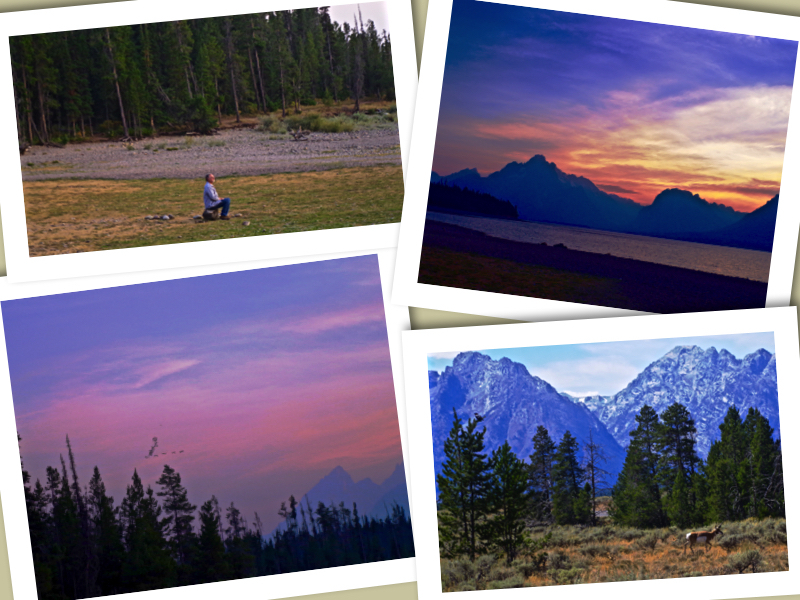 The Grand Teton National Park in Wyoming seemed like "the perfect choice". It has always been at the top 5 on the list of our most favorite places we've visited. 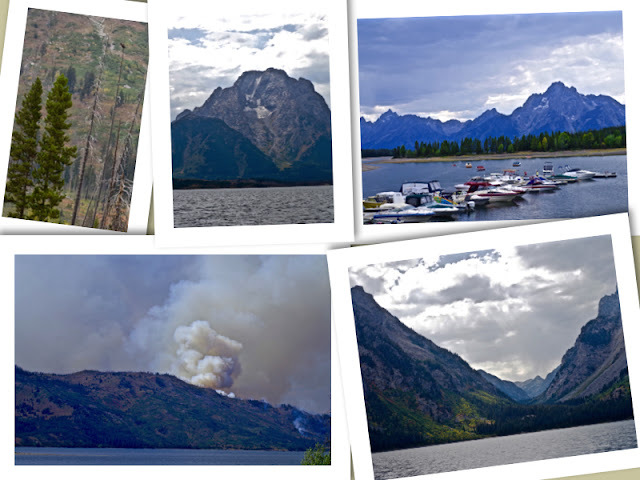 Quickly checking with the National Park, I found out we could only get 5 days at the RV Campground in Colter Bay. 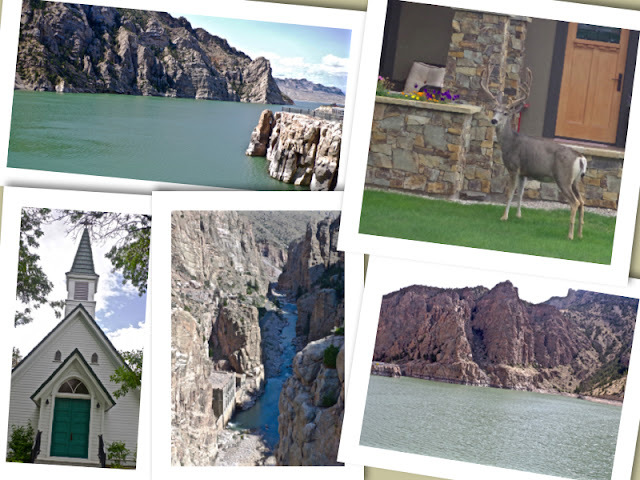 We decided we would stay a week in Cody beforehand, then go into the Park for the 5 days and stay the 1 special night, our anniversary night, at the Jackson Lodge itself (big splurge). Three years ago we had spent just a couple of days in Cody visiting their wonderful Buffalo Bill Center of the West museum, walking through the town, and enjoying the sights and sounds of their annual Plains Indian Museum Powwow, that was taking place. We just weren't there long enough to really take advantage of all that Cody had to offer and just knew that it was a great little town that we would love to come back to again. Now was our chance! So nice to be able to settle in, relax and take in the sights. One of the first things we did was take the Cody Trolley Tour! 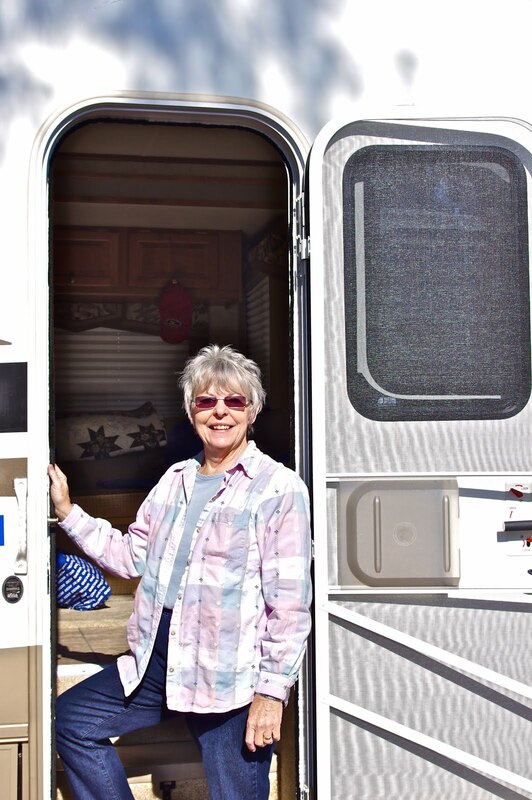 We have learned that this is such a fun way to get to know a town, all the "little known facts" that one doesn't learn on their own! Well, there's not a whole lot to Cody, but the two guides made it a whole lot of fun! They took us all around the small town and out to the Dam. We even caught a few deer grazing on some apples along the way! They filled us in on all the history (much of it we already knew) but it was fun to hear their stories, especially about the burial of disputes of poor Buffalo Bill Cody (seems he died in Denver at his sister's, so he's buried there instead of here in Cody, much to the chagrin of the town he created). The Buffalo Bill Dam was quite an engineering marvel, built from 1892-1906, it was the world's tallest Dam at the time. The thing that I marveled at was that it could only be worked on during the winter! This was because during the rest of the year the water was so high that it would pour over the area they were trying to dam up! Those poor men would be working in below freezing conditions, digging, pouring cement, etc. under ungodly conditions! Amazing...and it's not only still standing today, it's a thing of beauty! After that, we spent a wonderful afternoon at the Old Trail Town. What a unique and unusual place. 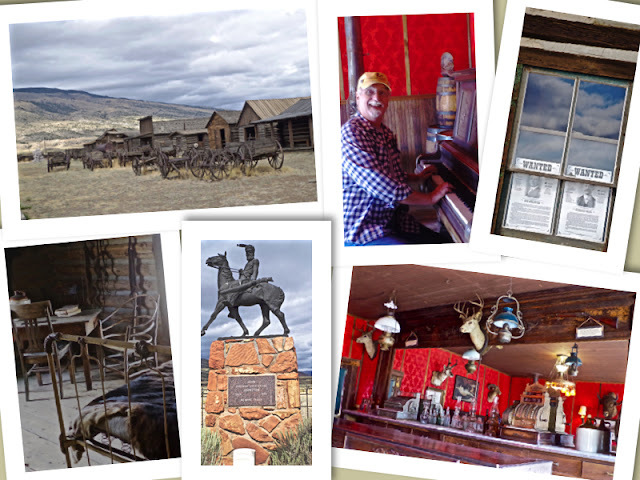 A gentleman by the name of Bob Edgar and some friends have collected authentic historic structures and furnishings from remote areas of Wyoming and Montana and reassembled them here where Buffalo Bill Cody first started the town of Cody...and what a great job they have done too! They have located and brought back the cabins of Butch Cassidy and the Sundance Kid, a Wyoming saloon frequented by Cassidy's "hole-in-the-Wall Gang", along with cabins from such scouts like "Curley", a Crow Indian army scout who helped Col. George Custer. A small cemetery is there as well, holding some "interesting" folks, one being the infamous Jeremiah Johnson who was portrayed by Robert Redford back in 1972. He even came here to be a pall-barer when they brought Johnson's body for the re-burial! 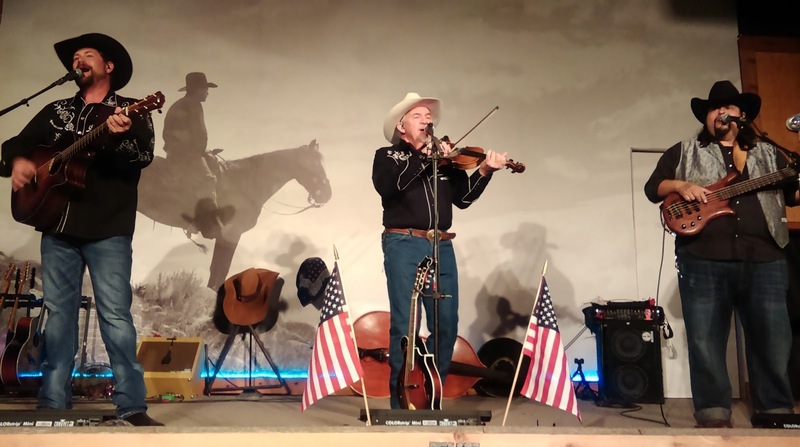 On our final night in Cody we spent at the Cody Cattle Company Dinner Show. What a fun night of good food and entertainment! Three guys sang and played foots stomping music for a couple of wonderful hours while we ate till out tummies were about to bust! It sure was a great way to end our stay in Cody! The one thing we did do this time, other than sit by the lake and read, is take the Jackson Lake cruise. We had a nice tour guide, a young college student here for the summer from Grand Rapids MI, who was quite knowledgeable and entertaining. As I said, the snow level was down, as well as the water level, but we did see a couple of young bald eagles and an osprey nest. Our last night was spent in the beautiful Jackson Lake Lodge, a splurge for us, but hey, once every 20 years, so OK! 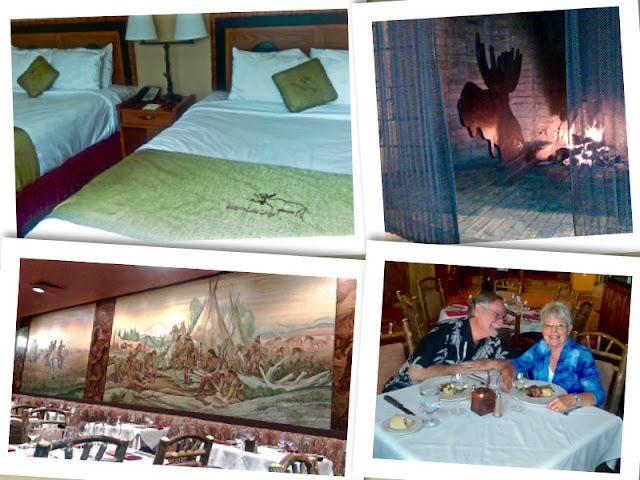 ;-) A special lovely dinner in the Mural Room, a toast to us and our life together...ever onward my love!